This is an insight on the world of kangaroos. There are many facts about kangaroos in this informative piece of writing, some of which are listed below. Kangaroos can be viewed essential animals that should not go extinct because they are very useful in the wildlife. Most kangaroos except a certain breed of them are not listed on the Endangered Species Act. The population is "somewhere between 15 and 20 million animals"( Whitfield 1). Hunting of the kangaroo is very active because of their meat which is very tasty and rich in vitamins, and for their pelts which are somewhat like a deer's pelt. Kangaroos are almost to the point of extinction because the hunting of kangaroos is such a vast sport in parts of the world. The kangaroo can offer many things for those with medical deficiencies. Kangaroos have very short front legs, and big powerful back legs to help them leap very far distances in a single bound. 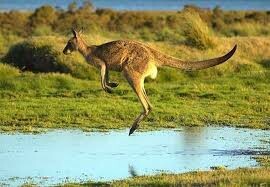 Kangaroos can travel up to thirty miles an hour and leap about thirty feet. 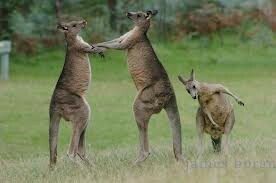 Kangaroos have very long tails which are for support and balance and are very strong. Kangaroos are marsupials which mean female kangaroos have pouches in the front of their stomach to hold their babies which are called joeys. The fur of the kangaroos can vary in color from gray to brown and sometimes red. Kangaroos can be anywhere from 5 ft. tall to 6 ft. tall. and weigh between 50 and 120 pounds but some can reach 200 pounds. Kangaroos have many different characteristics that make them very adaptable animals, such as they can swim to evade animals that would kill them on land and can't swim sometimes just to cool off and to do other things that may take lots of cooling off. It is said that "kangaroos don't sweat like most other animals so that's how they cool down after a hot day." ("Kangaroo," 1-3). According to Defenders of Wildlife, "kangaroos average their life at about six to eight years old"(Defenders of Wildlife 1). They are mostly found in Australia and Tasmania and surrounding islands. 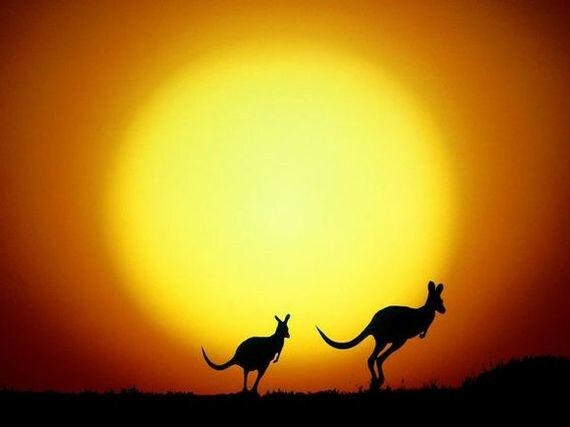 Kangaroos can live in many different places such as savannas, grasslands, woodlands, and forests. 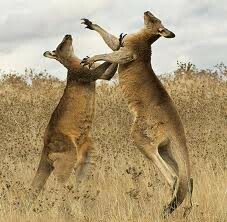 Kangaroos are herbivores so they don't eat meat but mostly grasses and other types of vegetation. They can also live without water for long periods of time. Usually kangaroos only give birth to one baby at a time. 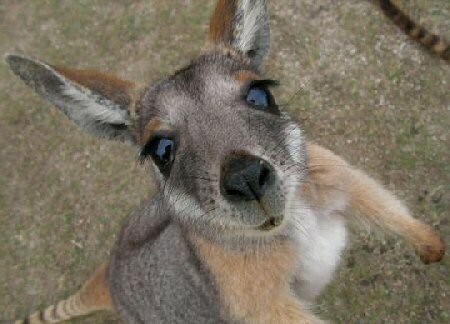 "The babies which are called "joeys" ,are usually very small averaging about 0.3oz for their weight and they are blind and deaf when born" (Defenders of Wildlife 2). Baby kangaroos stay in their mothers pouches for at least eight months but some to at least one year. kangaroos live in big groups called "mobs" they are also known as courts or troops and are usually led by the most dominate male of the mob. Marsupial are commonly known as pouched animals. Like other animals marsupials are covered in hair. Mother marsupials nurse their young even when the young get to be the same size as the mother. There are many different species or varieties of marsupials some are walking on four legs, while others hop around on two legs. Some of the marsupials are burrowing or grazing, yet some others are long nosed ant eaters and still more are evolving to fit their needs. Kangaroos fight with each other by boxing with their front paws, but defend themselves with powerful kicks from their hind legs. It is said "that when danger approaches, they warn other kangaroos by stomping the ground with their hind feet or thumping it with their tail. "(Card Wildlife Education Center 1). Whitfield, Phil. "Animal Planet - Surprisingly Human." Animal Planet. Weldon Owen, 1969. Web. 18 Oct. 2012. <http://animal.discovery.com/>. Smith , Dave. Marsupials. 05. Web. Rappaport, Jaime. "Defenders of Wildlife." Defenders of Wildlife. N.p., 9 2008. Web. 16 Nov 2012.